The Dart is a classic paper aeroplane. If you ask people to think about paper aeroplanes, this is the design that will most likely pop into their heads. The Dart's popularity lies in the fact that it is a very simple paper aeroplane: even young children and monkeys can be taught to make it. I've provided both photographic and video instructions for this plane. Photographic instructions are towards the top, video instructions at the very bottom. 1. Take 1 piece of A4 paper. 2. Fold the paper exactly in half longways, then open up the folds: this is to create a centre line guide fold so you get all your other folds straight. 3. Now fold along the blue lines so that the flat edge at the top of the paper exactly meets the centre line. You should aim for something that looks exactly like the diagram on the right. 4. Now fold along the blue lines again, so you get something that looks like the diagram on the right. 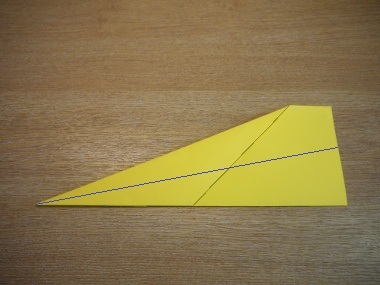 Try to make sure that the diagonal edge of the fold you created now meets exactly with the centre line. 5. Now refold along the centre line, so all the folds you made in steps 3 & 4 are on the outside. 6. Ok, we're almost done! We just need to fold the wings down now. 7. 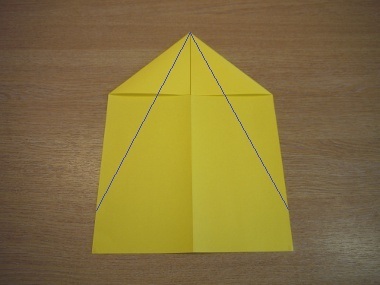 Fold the wing down on the other side and BOOM, you've finished the construction of the main body of the plane! HOWEVER, before you get too excited, remember that almost all planes need to be calibrated before they fly properly. Check out the calibration page whilst you perform you test flights. If photographic instuctions don't excite you, maybe you'll fare better with video instructions. Check them out, but remember you'll still need to calibrate your plane once you're done.